One of the key living trends in recent years has been the more creative use of lighting. Gone are the days when ceiling lamps, table lamps and standard lamps were the measure of all things. Flexibility and individual design are required to give the living space an individual touch. When playing with light, indirect lighting is a concept that is being implemented more and more often. 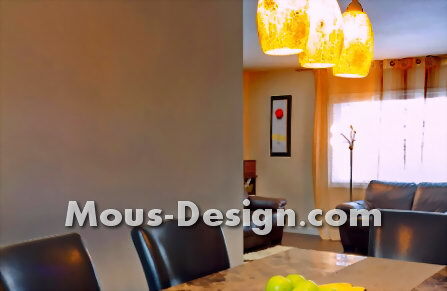 Here, lamps and lighting fixtures no longer emit their light directly and purposefully into the room. Instead, with indirect lighting, the light source is shielded and the light is redirected to the ceiling and the wall. From there it reflects into the room - a soft, warmer glow than with direct lighting is the result. The warm light and the avoidance of shadows enhance the well-being in winter and create a cozy atmosphere. If you want to illuminate a room indirectly, there are hardly any limits to your imagination, but a comprehensive lighting concept requires precise planning and experience in order to achieve that to bring desired results. A simple implementation of indirect lighting succeeds, for example, with commercial ceiling floods. If one decides for a fixed light installation, the consultation of a specialist who pays the room a positive light by lighting is profitable. Exactly matched wall lights, ceiling washlights, fairy lights and curtain covers offer many opportunities for variation, which, with the appropriate know-how, can turn a normal room into a real gem. Due to the necessary cables and connections, it is advisable to schedule indirect lighting from the beginning and consult experts. For a room usually several light sources are needed, and decor and decoration must be coordinated for a coherent overall picture. A beam of light displaced by a few centimeters decides whether a piece of furniture will be good or bad or that a picture will have its full effect. As far as housing trends are concerned, indirect lighting will prevail in the long term as well. Expertly planned and implemented by the craftsman, it offers a much more comfortable living experience with the same amount of energy and makes dark winter pleasantly light and cozy.